STORRS - Thomas Katsouleas, the provost and executive vice president of the University of Virginia, was appointed Tuesday as the next president of the University of Connecticut, promising to try and double the amount of research money coming into the school over the next decade. Katsouleas, a 60-year-old electrical engineer and plasma scientist, was unanimously approved as the school’s 16th president on a voice vote by UConn’s trustees Tuesday after receiving the endorsement of Connecticut Gov. Ned Lamont. He replaces Susan Herbst, the first woman to hold the position, who is stepping down after leading the state’s flagship school since 2011. Katsouleas will begin his term Aug. 1 with a five-year contract that will provide him up to $675,000 a year, including a base salary of $525,000, free housing and a $15,000 a year car allowance. He will receive an automatic 3 percent salary increase each year and other deferred compensation. He said he will be focused on the student experience at UConn and plans to hold regular office hours at a local coffee shop. But he said one of his highest priorities will be growing the school as a research institution, from about $265 million in federal grants and other money to more than $500 million within seven to 10 years. That, he said, would produce an ongoing immediate benefit to the state economy and create intellectual drivers that would attract startups and other businesses. Katsouleas said his initiative will require recruiting more top faculty and more improvement to facilities, acknowledging that will not be inexpensive. He promised to build on the work of Herbst, whose tenure has included major state investment in capital improvements at the school, including the more than $1.5 billion in bonding for the Next Generation UConn initiative and $864 million for Bioscience Connecticut, which funded major construction on the school’s campuses and at UConn Health. She also oversaw last year’s $140 million move of UConn’s satellite Hartford campus from the suburb of West Hartford back to the city’s downtown. Lamont said he and Katouleas have met with top business leaders to begin discussions about how the school can better partner with the private sector to fill its workforce and innovation needs. 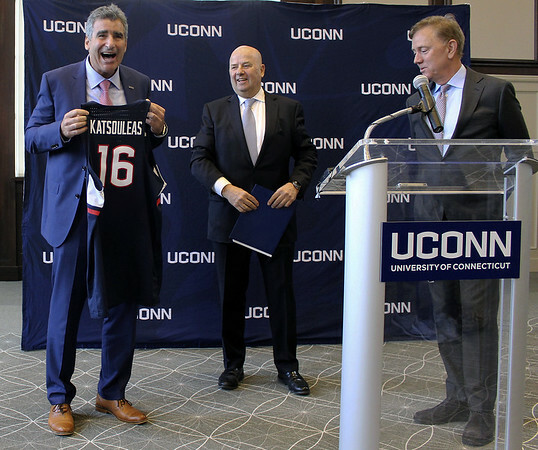 “UConn is an economic engine as well as an engine of opportunity for people and I think, Tom, we’ve got the right man for the job,” Lamont said. Katsouleas has served as provost at Virginia since 2015. Prior to that he was the dean of Duke University’s engineering school. He has a PhD in physics from UCLA and also taught engineering at the University of Southern California. He said he has some experience working with legislatures and understands the state has a difficult budget situation. He said he hopes the school will continue to receive generous and stable support from the state, but it must rely more on research funds and philanthropy. Katsouleas said he also understands the importance of UConn as an athletic institution and said he’s committed to keeping the Huskies as a major player in college sports. He said he’s also committed to building the American Athletic Conference and has no plans to try and move the school into a different one. Posted in New Britain Herald, General News, State on Tuesday, 5 February 2019 18:51. Updated: Tuesday, 5 February 2019 18:53.